Routers and router bits can be a considerable investment, and being precision tools, must be taken care of properly to ensure they last as long as possible. To avoid many of these problems, there are some simple and inexpensive tips that will help to prolong the life of both routers and the bits. If this advice is followed, it will ensure these tools will perform to their utmost, giving a superior cut and finish. Check the collet to see if it's in good condition. Even a new one is worth inspecting to see if there are burrs from manufacturing that will effect its holding power, as these are easily removed. A used collet will, more often than not, need some simple maintenance to ensure that it functions correctly. Dust, debris, and resin can build up inside the collet and stop it gripping tightly on the router bit's shank, so these must be removed. First, obtain a small brass brush, then give the collet a liberal squirt of a penetrating agent, such as WD40®, to soften the build-up of compressed wood dust and resin. Then take the brush and work it through the collet cleaning out the debris. Next, inspect the collet to see if there is any wear. This will tend to look like the inside end of a trumpet. If there is evidence of this, throw it away immediately and get a replacement. 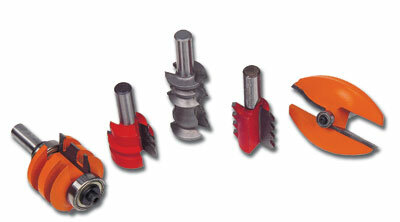 Do not be tempted to use a worn collet as it is dangerous and will not hold the router bit securely. To make sure that the collet can be tightened properly, clean any debris from the thread on the end of the router's spindle, and the inside thread of the collet nut. Some collet nut designs have a captive nut on the collet and others don't, but in both cases, the nut's thread must be kept clean. The biggest problem with routers is 'run-out', where the spindle of the router has been bent, due to a drop or a sideways knock. Even if the shaft is only slightly bent, the router may display violent vibration, and the larger the diameter of the router bit the worse it will get - some will wrongly attribute this vibration to an unbalanced router bit. To find out if a router's spindle is running true some manufacturers supply a tool for the job, or one can be made from straight steel bar the same diameter as your collet's capacity. The tool is placed into the router's collet, then the router is placed, inverted, onto the bench. Plunge the router so the tool extends well past the surface of the baseplate. Then, place a square on the router's baseplate and against the body of the tool and slowly turn the spindle - ensure the router is unplugged. If the router is running true the tool will remain in contact with the square as it rotates. If the shaft is bent however, the tool will deviate from the square as it turns. Unfortunately this may mean the end of the router. Do not attempt to use the router with a bent shaft. The finish achieved will be poor, and doing so is dangerous. While in the area of the router's spindle it is worth checking its bearings. This can be done by holding the end of the spindle and trying to move it side-to-side, and then turning it slowly under pressure. If any lateral movement or a roughness when turning can be felt, the bearings will need replacing. Bearings can be obtained from the router's manufacturer and replaced, or better still have the job done by an authorised repair agent who will provide a warranty for the work. Good quality router bits are often ruined by poor storage. Many are shipped in storage containers or protective vinyl packaging, and these make ideal storage. Alternatively, sets of bits are commonly supplied in custom-built wood cases, which will protect the bits and make them readily available for use. If you like to buy your router bits individually but want to keep them all together in a storage box which will continue to accommodate a growing collection, my best advice is to build your own. Depending on the type of material used, there will be an inevitable build up of wood dust and resin on the bit itself that, if left unchecked, will affect its performance. This debris restricts the gullet of the bits blocking the exit path of the new chips, which causes excess friction causing the bit to overheat, shortening its usable life. To combat this, spray the bit with WD40 to soften the resin which is then easily removed with a plastic or wooden stick. This should be done regularly, after each use if possible. If the resin has become 'baked' on the bit it will need soaking overnight in a dish of WD40® to soften the resin, which then can be removed as described previously. Many bits now have a non-stick coating that dramatically reduces the build-up of resin causing the bits to last longer. Regularly inspect the shank of router bits, as it is crucial that this is in good working condition to fit the collet properly. If the collet has come loose and the bit has spun while in use, it is possible that the bit's shank will have been damaged. There will be ring marks around the shank, and possibly burrs as the shank has been 'turned' in the collet. If the damage is slight, use some fine wet-and-dry abrasive to smooth the shank, but in more serious cases dispose of the bit. It is also possible to tighten the collet nut, but too much will overstress the collet. Keeping up with this regular maintenance schedule will prolong the life of both the router and bits, as well as producing better finished results. With only a small investment in time, and a few readily available items, your tools will provide you years of reliable service. "Regularly inspect the shank of router bits, as it is crucial that this is in good working condition to fit the collet properly"